You Spend A Good Piece Of Your Life Gripping A Baseball, And As It Turned Out, It Was The Other Way Around All The Time! Greetings, from the friendly confines of theoleballgame.com. That headline captures the essence of every coach I have known. 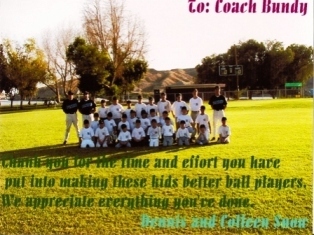 My name is Rick Bundy and I am the owner/builder of this website about coaching and playing youth baseball. 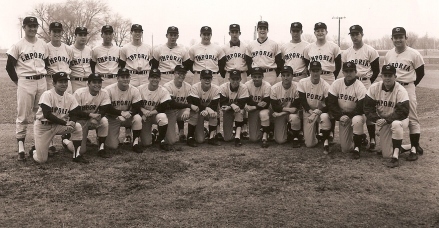 This page is titled "About Us", as the contents herein truly are a compilation of my 55 years of playing and coaching baseball, and the lifetime of information learned from all those I have come in contact with. While my mom thought for sure I would outgrow this "BASEBALL FEVER" thing, it doesn't look likely to happen any time soon, as my 43rd high school coaching season finished and I have started an additional experience with Baseball's Next Level, for the summer and fall. New and different experiences within the world of youth baseball. I consider myself fortunate. There is nothing quite like time spent on a baseball field! High School Baseball 4 years/ 2 varsity. Within my playing experience, I had the good fortune to play for 10 uniquely different and wonderful coaches. Jack Smitheran, the gentleman standing behind me in the photo to the right, went on to the University of California-Riverside, after 4 highly successful years at Emporia. I consider myself lucky to have played on his first team as a head coach, my last as a player. Each and every one had a profound and positive effect on my life. While playing for that many different coaches may not be the most desirable scenario for an athlete, it was a tremendous learning environment for someone who would pursue a career in education and athletics. From each one I stockpiled ideas for how to do things, as well as things I would not do. As you develop your coaching philosophy and your coaching personality, it is important to remember to be yourself. Things that work for some coaches may not work for you, and vice versa. Sandwiched into those 13 years and 10 coaches I learned what it meant to be a reserve player, a utility player and the easy part, how to be a starter. Each role brings to the table its own unique perspective on the game. Within those 13 seasons I played on a State and Area Champion Little League All Star team, a state runner-up high school baseball team, 2 Junior college seasons where we won a combined 8 games and finished on a team in the NAIA World Series that was 44-12. Carefully tucked into those years was the opportunity to experience being cut from my Jr. High team, something devastating to me at the time; but a truly valuable feeling to experience for someone that would become a coach, faced with the inevitable and difficult task of telling a young player there is not a spot for them to play at that point in time. For myself, there has been nothing more difficult to do as a coach. The Arizona Diamondbacks’ Baseball Academy has provided me a tremendous opportunity to learn about and work with youth baseball. We work with a truly diversified group of campers. Some are starters on their Little League teams as well as league all star teams, others have never done anything with baseball, to every place in between. What they all have in common is a burning desire to play baseball, that “Baseball Fever” thing. You can see it in their eyes, you can hear it in their voice. One of the special things for me over the years has been the opportunity to teach and coach the kids of former players and students. There have even been Diamondbacks’ campers that became students and players, as well as opposing players. This spring, 2009, I learned that two of my former players are coaching the Junior Varsity team for one of the schools here in town. To my knowledge, the first two in that category. They were special individuals to have on a team, and will make great coaches. For me, that is a terrific process to be a part of. My newest opportunity is working with Baseball's Next Level, which has again created a working experience with some players whose fathers and uncles played for me while I was still teaching. It is hard to describe just how special that is. I hope this provides you with some insight into who I am and from whence I came. My experience has always been that baseball coaches from all levels and walks of life are enthusiastic to share information and experiences with others. That is my main goal with this website, while attempting to make it the best possible site for coaching and playing youth baseball on the web. Someone once told me, “the older you get, the better you were.” If that were to be true, at 71, it must follow that I was really, really, really good. I hope you enjoy your visit to the site and are able to gain something positive and/or entertaining with each visit.